When should you use an inline extractor fan? Trade » When should you use an inline extractor fan? Even the least powerful of these models is nearly twice as powerful as the best axial fan, meaning moisture and odour are removed more quickly, reducing the likelihood of damp and mould formation. The impeller arrangement in an inline fan is commonly known as ‘mixed flow’ (Manrose’s inline fans form the ‘MF’ range to reflect this) – and refers to the fact it combines the airflow characteristics of both centrifugal and axial impellers. This combination of impeller types results in greater exhaust pressures and can push the extracted air down longer lengths of ducting and round any necessary bends in the ducting without significantly affecting performance. The standard wall mounted axial fan is designed to be ducted straight through the wall and most will be struggling on duct runs over 4 metres – and any duct run of that length usually has bends in it too. 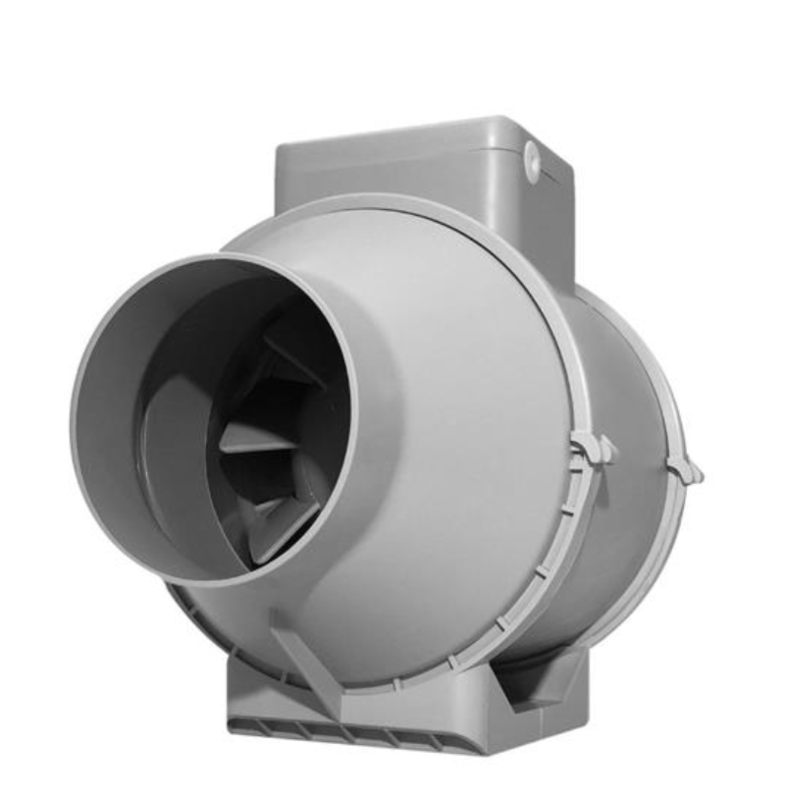 Inline fans by contrast can comfortably sit on duct runs of up to 10m – and remember, the extraction rate is far higher to start with. Inline fans sit in the ceiling void or loft above the bathroom. 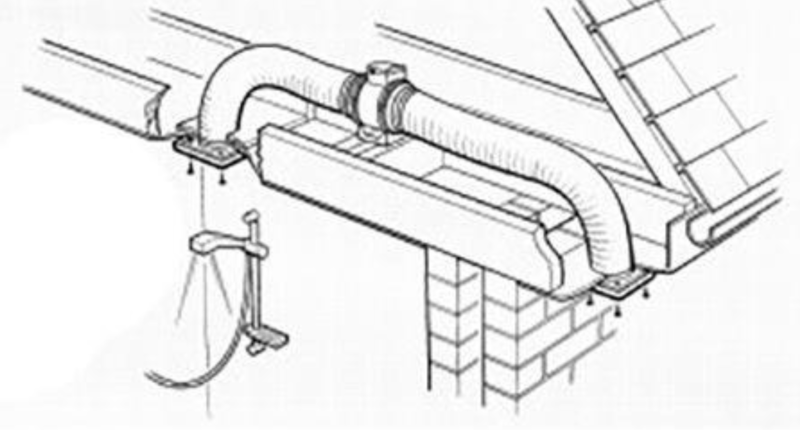 Ducting is attached to the exhaust spigot and run to the external grille which is usually situated under the eaves. Meanwhile, ducting is attached to the extract spigot and run to the discreet grille in the bathroom ceiling. The fan is then simply wired into the lighting circuit, so that it comes on when the user turns on the bathroom light, the cables for which invariably are already in the loft above the bathroom anyway. The beauty of this installation is that the work – particularly if carried out in the loft – is relatively very quick and easy for the electrician, there are no electrics in the bathroom and probably best of all – no re-plastering, painting or tiling needs to be done after installation, which can be both costly and difficult when installing a wall mounted axial fan. When fitting a wall mounted fan, it must really be installed on the bathroom’s external wall. But this may be the opposite side of the bathroom to the shower or bath where the steam is generated. This presents the obvious problem that it is travelling across the bathroom, vastly increasing the opportunity for moisture and condensation to form on cold walls. By contrast, regardless of where the inline fan is installed in the loft, the duct point can be directly above the shower or bath, meaning that steam is extracted at source. In this case, very little ambient moisture pervades the rest of the bathroom so even after a long shower, the mirror is still clear! In summary, if you are investigating a ventilation solution and you have space above the bathroom, an inline fan should be your first consideration.